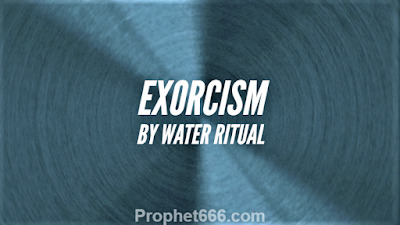 In this post, I have described the simplest method of exorcising a person who is believed to be affected by dangerous evil energies, like ghosts, spirits and demons. This simple exorcism ritual does not need any kind of Mantra or Prarthana Chanting and can be practiced by anyone to give relief to a person who is believed to be possessed by any kind of negative energy, evil eye or black magic spells. In this Hindi language, this exorcism ritual is called as Jal Me Nakaratmak Urja Kheech kar Nikalne Ka Totka or a paranormal remedy to capture evil energies in water and remove them from the body and surroundings of a possessed person. Apart, from Bhoot-Pret and other similar energies, this Totka is very effective in removing Buri Nazar, Jadu-Tona, Kiya Karaya, Shaap and Bad Dua or black magic spells, malefic gaze and curses. Water is a one of the most effective "substances" for cleansing negative energies and many simple but effective remedies for getting rid of evil and harmful vibrations, which make the use of water can be seen on this site. Most of these remedies make the use of the inherent cleansing powers of water and do not need the use of any Prayer or special Religious Rite. The simple steps mentioned below have to be followed in order to successfully practice this remedy to exorcise harmful energies from the body and surroundings of an affected person. 1] The remedy has to be practiced for seven days continuously and as it is a standalone paranormal remedy, it can be started on any day. 2] At night, just before the possessed person goes to sleep, the practitioner has to keep a Kalash or a metal jug filled with water near the head of the possessed person. 3] In the morning, the practitioner has to hold the Kalash in his hands and perform an Utara or an exorcism ritual of the possessed person by rotating the Kalash in a clockwise or Dakshinavart direction, seven times in all, over the head of the possessed person. 4] Then, he has to take the Kalash and pour the water on the trunk of a Peepal Ka Ped or a sacred fig tree. It is better that the Peepal Ka Ped should be a little distance away from the residence of the possessed person. If there is no Peepal K Ped, in your locality, then, you can try performing this remedy by pouring the water on the trunk of any other tree, but make sure that the tree is a little distance away from the home of the affected person. 5] While, performing this exorcism ritual, the practitioner should not speak to any person and if anyone tries to speak to him, he should ignore that person and continue the remedy. In the same way, while coming back to his home, after pouring the water, he should not speak to any person or glance back over his shoulder. If you suspect that you are the affected person, then you can ask any of your family members or friends to person this simple exorcism ritual on you. However, that person should possess strong will power and self confidence and believe that the ritual will really work on the affected person. Notes- This is a standalone paranormal remedy and other than what is mentioned in this post, there is no need to chant any Mantra or Prayer or perform any other ritual.